In the year 2007, almost 100 years after Absinthe prohibition, the alcoholic spirit Absinthe also know as the Green Fairy was once again legalized in the USA. In the USA all Absinthes have to be thujone-free by law. But, and this makes the difference, a tolerance level of up to 10mg of thujone per litre is allowed. So basically you can produce real Absinthe in the USA with thujone, but not more than 10ppm. In the European Union 35mg are allowed. Nevertheless this is a very remarkable step as it means that the FDA authorised Absinthe once again for sale in the USA! Amongst other, this change was accomplished by the efforts of two companies. One was and is an Absinthe producer in Switzerland, Kubler Absinthe, the other Viridian Spirits, a US based company. The two of them worked independently of each other and Viridian Spirits was the first to get the legal approval for their brand Absinthe Lucid, although Kubler was the first and earliest to fight for Absinthe legalization in the USA. Kubler is made at a small family-owned Swiss distillery, it is the same distillery, that in 2005 had been instrumental in the re-legalization of Absinthe in Switzerland itself. Viridian Spirits was a new startup company controlled by Jared Gurfein, a New York attorney. They cooparate with Ted Breaux, inventor of the Jade Absinthes. Below you can see photos of real Absinthes, that you can buy online at our store. 100 years there was no legal Absinthe in the USA. But actually the liquor Absinthe can look back on a long history in the USA (and in South and Central America). The most popular spot in the USA for the consumption of Absinthe was New Orleans and its French Quarter. In this quarter the famous Old Absinthe House was and still is located. It has been a tourist attraction for more than a century and you can still see the original marble Absinthe fountain, which once again is now used to prepare the Green Fairy - legally.... To put it in a nutshell and to answer the question of interest, is Absinthe lagel, yes the liquor is legal! Not only in the USA, moreover in the whole world. Actually the USA was one of the last countries to legalize the Green Fairy. In the European Union the legalization started already in 1998. Absinthe is not illegal anymore. You can say a big dream came true: Almost 100 years we had to wait, until Absinthe got legalized once again. Absinthe bottles can now be found legally in alcohol stores, restaurants and bars worldwide and within the USA. Questions like: Is Absinthe illegal in the USA...? fortunately belong to the past. Besides ordering a glass of Absinthe in bars and restaurant the easiest way to buy the green liquor is to order it online. Check out our Absinthe for sale in the USA info site for more details. The ALANDIA online store offers a wide range of true Absinthe and original Absinthe accessories like Absinthe spoons, Absinthe glasses, Absinthe fountains or Absinthe pipes. ALANDIA was founded in the year 2001 and has its headquarter in Europe (Germany). Shipments to the USA are processed on daily basis and after the placement of your order it takes approx. 8-10 days (Airmail) or 2-3 days (Courier Express) until the Green Fairy arrives in the USA. The delivery is guaranteed, therefore you, the buyer, has no risk at all. Absinthe is legal in the USA, therefore you do not have to worry about any custom issues. Of course all other Absintheurs can order at ALANDIA as well, we ship worldwide. People sometimes think that real Absinthe is not legal in the USA. That is not the case. To avoid misunderstandings here are some more details about the legal status of Absinthe in the USA: According to the FDA an amount of 10mg thujone per litre of pure alcohol is legal. In the European Union 35mg are legal. That is the difference between US Absinthes and European Absinthes. As thujone is set free during the distillation process of wormwood, you can say that European Absinthes can be made with more wormwood as in the USA. But this depends on the specific recipe. Not every Absinthe in Europe has 35mg, as it is not the objective of every distiller to make the strongest Absinthe legally possible. If you want to know more about Absinthe and thujone and want to know which brands are the strongest, visit our info site: Absinthe and thujone. But generally said, Absinthe has much more to offer than thujone. It is a drink of culture with a very rich history. You should appreciate this uniqueness of the liquor and drink it responsibly. The green liquor "Absinthe" looks back on a long tradition in Europe. Countries like France, Switzerland or Spain have produced the drink legally since decades. Like we described, the legal situation there is different compared to the USA. 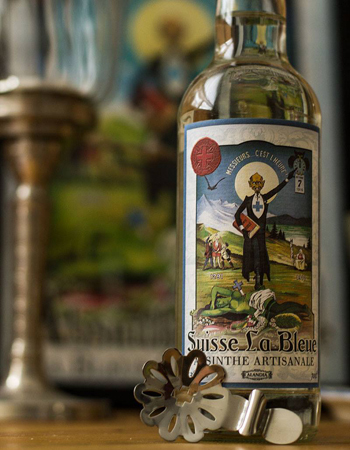 The roots of the Absinthe culture are in Switzerland and France. The first bottle of Absinthe was produced in the late 18th century in Couvet, right at the border to France. It was commercially distributed by Mr. H. L. Pernod. The grand-grandfather of the French Pastis Pernod. Pernod brought Absinthe to its fame and glory. At the turn of the century Absinthe distilleries could be found all over Europe and Absinthe places were a common institution in cities, especially in 19th century Paris. In the USA the Green Fairy, how Absinthe is lovingly called, was mainly drunk in the French quarter in New Orleans. In the Old Absinthe House, the famous Absinthe bar in New Orleans, writers and poets like Hemingway enjoyed their holy glass of Absinthe. The most historically known Absinthe brand in the US was Herbsaint and Absinthe Butterfly. There exists a new version of Absinthe Butterfly, but it is not from the historical distillery, it is made in Switzerland on the basis of contract manufacturing. Herbsaint is still sold in the USA but as a thujone free Pastis / Anise version. - Absinthe is not a hallucinogenic drug (by the way, it WON'T show up in any drug test). - In the European Union 35mg of thujone in an Absinthe are legal. In the US only 10mg (or less) are legal. These brands are considered as "thujon-free". So basically the legalization of Absinthe in the US is a matter of a higher tolerance level of thujone. But thujone is not the most important thing about Absinthe. The green liquor should be consumed for other reasons: It has a long tradition and a very fascinating ritual. You should enjoy your glass of Absinthe and drink it responsibly. Remember, you do not drink Absinthe as a shot. You should serve the fairy with cold water and some sugar. For the preparation you need an Absinthe glass and an Absinthe spoon. Below you can see a video of the traditional French Absinthe ritual, the way how you should prepare your glass of Absinthe. Historically, Absinthe was drank between 5 and 6 pm. This time was called the Green Hour. We hope the info on this site has given you some clarity about the legal status of Absinthe. Where can I buy legal Absinthe online? The best shop to buy Absinthe online is ALANDIA. There you will find real Absinthe and Absinthe accessories. Absinthe Spoons, Absinthe glasses, Absinthe fountains, Absinthe Posters, Absinthe sugar and a lot more. The world of Absinthe is for sale there.